Come celebrate the 40th anniversary of his landing! 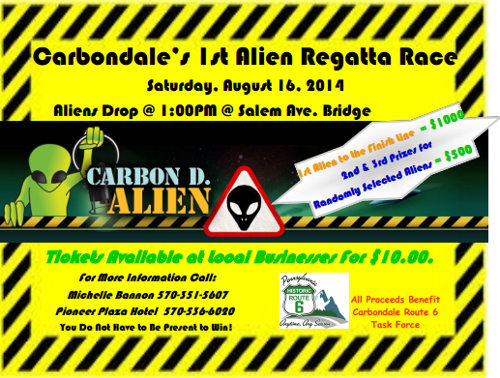 Help support the Route 6 Task force on tourism by participating in the first ever Carbon D. Alien Regatta. For $10 you can have your own alien in this "Race" down the Lackawanna River right through downtown Carbondale. The winning alien will take home a cash prize of $1000 and two other randomly chosen aliens will win $500 each. The Regatta will be held Saturday August 16 at 2pm and you need not be present to win. Only a limited number of aliens will be sold, so hurry and get yours today by calling 570-282-2882. In Honor of the 40th Anniversary! Celebrate Carbondale's History, and the 40th Anniversary of the Carbon D Alien, by picking up a copy of Images of America: Carbondale. This fact filled book is available locally at Lynn's Hallmark, The Carbondale Public Library, and the Best Western Pioneer Plaza. It can also be purchased online by following the links below. The lagoon. The lantern. The Legend. On the evening of Saturday November 9th, 1974 a small group of teenage boys reported seeing a glowing, unidentified, flying object crash into a pond near the southern edge of Carbondale, Pa. This report would set in motion a series of events that would thrust this small city into the national spotlight and, over the next 48 hours, play out like a case study in group psychology. These events would reach an inevitable and anticlimactic conclusion on Monday November 11th. This conclusion would give birth to rumors, speculation and a suburban legend that would refuse to die.